Sidewalk history – Josie lives! There’s a stretch of sidewalk we’ve walked thousands of times in our 30 years here in the neighborhood. One piece of it is distinctive for the moment in time it captures, when a little girl scratched her name into fresh concrete and claimed the sidewalk out in front of her house as her own. As we’ve stepped across her graffiti over the years, we’ve often wondered where Josie went; it must be a good few years since that concrete was fresh. That particular stretch of sidewalk has been in rough shape recently, heaved up by roots from nearby big trees and just generally tired. After all, these sidewalks were made more than 100 years ago and have been patched up over the years. That’s a lot of freeze-thaw and wear and tear. 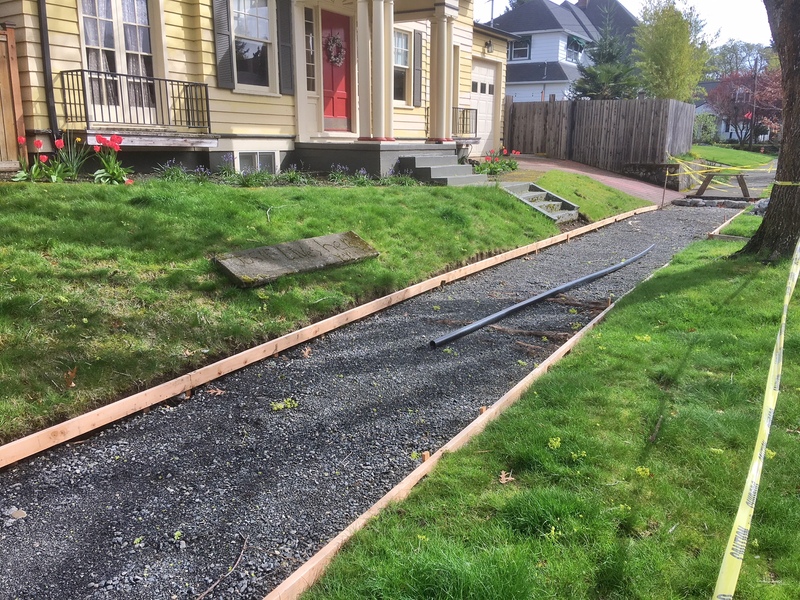 A couple weeks back, we noted the current safety-minded owner had quite reasonably pulled out the entire sidewalk and formed up for a new one. When we saw the pile of rubble left over from the broken pieces, we figured that was the end of Josie’s concrete. Hey, this was only a sidewalk, and it was a serious tripping hazard that needed to be replaced. Sorry Josie, but it was time. Still, there was a tiny pang. It’s just a small thing, but as AH readers know, we tend to get a little sentimental about losing places that have meant something to people over time. So, imagine our wonder when on second look we noted the owner had carefully carved out Josie’s graffiti and was preparing to add it to the new sidewalk (at least, that’s what it looks like to us). This was not an easy thing to do and required some intentional thought and planning, maybe rental of a concrete saw, and careful handling. It would have been way easier to just keep working away with the jack hammer. Again, it’s a small thing. But we noticed. This little job is a tip of the hat to the past and show of respect. Important to note even small examples when people go out of their way to bring the past along into the future. Bravo!